It’s a good question, and one of the more common ones we’re asked. A lot of people think we own a Christmas tree farm. We don’t. Instead, we buy from tree farmers, and we’ve learned a lot over the years about what they do and how they bring their crops to market. Almost every state has its share of ‘mom and pop’ Christmas tree farms with cut-and-carry trees. These are great fun for families, but most small farms don’t ship trees or sell the large quantities that we require for our clients. So we turn to larger Christmas tree farms, wholesalers, to meet our needs. One of our suppliers is Valfei in Southern Quebec. They own and farm over 1,000 acres and supply nurseries and tree stands across the Northeast and in Canada. They are usually growing a million or so trees of many different varieties on their farms. But they only cut and sell a small portion of those annually, allowing the rest to mature for future years. It takes seven to ten years to grow a tree that’s ready for harvest. 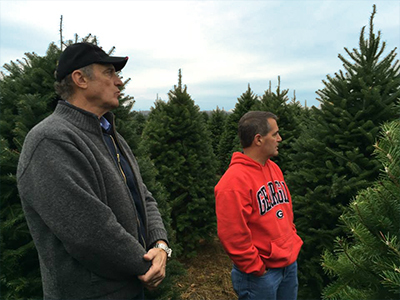 Valfei, like many Christmas tree farms, is a family run business. We had the pleasure of touring their farm last year and meeting the owners, Serge and Collette Vaillancourt. Large wholesalers employ a seasonal workforce to help bring in their crop and many will start cutting for their major customers as soon as October. Most of their large orders ship out on tractor trailers before Thanksgiving. In the East, if you buy a precut tree from a big garden center, chances are it has come from a large wholesaler in the North or from the mountain regions of North Carolina. On the West Coast, Oregon is the largest tree producer. Christmas tree farming, like any other type of farming, is hard work. But it’s a labor of love for the farmers that we have met or talked to. We’re appreciative of all they do to make Christmas memories for our families.